Our assignment for this month was from Laura Purdie Salas: write a short poem (6 lines or fewer) about an animal, using all three of these words: spike, roof, shadow. My first thought was to write about a baby pangolin, because have you seen a picture of a baby pangolin? I have more predictably settled on a cat. Because of course. spikes her felt bird when she wakes. Beautiful! Love that last line. A last line is everything, in a poem! And if you hadn't said what it was, I would have imagined that baby pangolin(???) was a concrete garden ornament/mythical creature! Aren't they adorable? They often look a little apologetic (at least in photos). Oh my gosh--haha! You totally had me salivating for a baby pangolin poem:>) But I adore cats, and this is wonderful. That last line--whew! And I loved how you used the roof idiom to show her domesticity, her indoor-ness, which makes the ending EVEN better! I just didn't feel up to doing the research on pangolins -- LOL! And she "twitches" without seeming to! You've shown the cats I know wonderfully, Kelly. Amazingly, I'm sharing an old X.j. Kennedy poetry book & he has written a pangolin poem. Until I read it, I'd never heard of this animal, & now you've shared the cutest pic of one. Thanks for all! 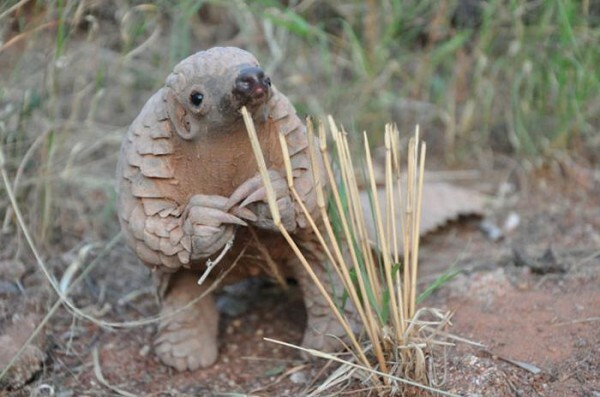 I've spotted some pangolin photos online over the past few months, and know little to nothing about them apart from them being ADORABLE and improbable in photos. And how cool is X.J. Kennedy, as always? Ha ha -- that pangolin tease! LOVE your cat poem, though, of course. You've managed to get layers of meaning into those six lines, so that I keep having to read it again. Wonderful word picture of your kitty! I am so excited you are back! And thank you for the kind words! As much as I love that baby pangolin, I'm always happy for a cat poem! I love cats, too. Thanks! Her dreams give her fodder for abrupt attacks when she wakes! Kitty's adorable in a way the pangolin doesn't even imagine yet. That baby pangolin looks super apologetic, like it's sorry to interrupt. Love the different ways you all have used spike! That was the one that made the poem hardest, in my opinion! I have never seen a baby pangolin, but I want more! And your poem so captures a cat. Aren't they poetic in the way they sit and twitch and pounce? I keep meaning to watch The Lion In Your Living Room, which is a one-hour documentary about cats. They are far closer to their wild cousins than dogs are, apparently. And I love love love my kitty. And want to learn more about pangolins. Gotta say I was 99% sure you would enshrine a cat! But I love how quietly you've used the words so I had to go back and look for them.....they definitely walk in on "little cat feet" as Carl Sandburg would say. At least until that SPIKE. Ha! What a great ending. I found SPIKE to be the hardest word to work into the poem, but then remembered the cat tossing her felt bird around and it worked out. And yes, I am predictable . . .
First, that pangolin is a big old tease. He's adorably cute and I think he looks a bit like Yoda. I do hope we get a pangolin poem some day, but in it's stead is a perfect offering. I really love this view of a cat, and I'm with the others in loving the spiked bird.